FIRST DAY OF SWIM LESSONS! Children are often nervous for their first day of swim lessons, even if they have taken them before. They are going into a new environment with a new person. The best thing to do is be on time or early (especially early on the first day) so that they can meet their new instructor out by the pool before they get in. It is also important that the instructor get to talk to YOU about your little swimmer. We want to find out more about your child, and no one knows them better than you! After meeting with the instructor, you can start to get your swimmer ready for lessons (putting on goggles, putting their hair up, taking off shoes and cover ups, etc…). If your little swimmer is under three years old, please make sure they are wearing a swim diaper. If you do not have one, we have them for purchase at the front desk. Once you have walked your swimmer over to the instructor, we ask that you take a step back and take a seat a little away from the lesson. We know that you want to be right there for your little one, but unfortunately that can be quite a distraction for our little swimmers. We love that parents want to be attentive and there for their swimmer, but we want the instructor to have the swimmer’s full attention. After that, sit back, relax and watch your little swimmer and their instructor get to work! 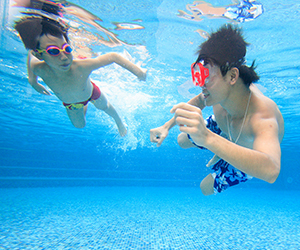 TIP: If you are unsure if your child needs or will wear goggles, let them borrow some from the instructor on the first day. If they like them, invest in some goggles and that have adjustable straps and nosepieces (those always fit the best, and they can wear them even as they grow!). Sometimes little swimmers are unsure and nervous in this new environment with this new person and may start to cry. It’s okay! The best thing to do as a parent is to step back and allow the instructor to sooth your little swimmer and allow them to bond. This will build trust between the instructor and child. It is best that you keep back in your seat (preferably that is out of direct view of your child) and to let the instructor help your swimmer. After the lesson is over, let them know how well they did and how proud of them you are. Ask them how the lesson went and what they learned. Sometimes swimmers cry only because they see you and want you, but once they cannot see you they calm down and begin to focus on the instructor. Other factors that make our swimmers get upset and cry can be: being hungry, thirsty, tired, or have just been woken up from a nap. We ask that you please take naptime, other activities, and snack time into consideration when scheduling your lessons. Please review all of our pool rules before your first lesson. All of our rules are there for our swimmers safety and to make sure that everyone has a great experience at our pool. Your safety is our first priority. You are able to leave the pool area during the lesson, but you must be there to drop off your child and there to pick them up promptly when the lesson ends. Instructors have lessons right after each other, so they will not be able to wait with your swimmer for you, and your swimmer cannot be alone. You are not able to leave the facility during the lesson; you must stay within the gym during the lesson if you are not at the pool. To keep our little swimmers from turning into lobsters, we suggest that everyone put on sunscreen at least 30 minutes prior to their lesson. We suggest at least 30 minutes before because it gives time for the sunscreen to really set in so it won’t all come off in the pool. TIP: Rash guards/swim shirts are great for children who have sensitive skin and react easily to sun. You can find them for as little as $5-$10. If you have not already registered for your swim lessons yet, please visit the front desk of the gym you would like to like to enroll at or call and ask to speak to the Pool Manager. You can sign up in the club or over the phone with a credit card. By paying for the lessons, you are reserving your spot and ensuring your desired time and class. Class sizes are small, and spaces are limited, so please register as early as possible, as spots will be reserved on a first come, first serve basis. Registration ends, generally, the Saturday before the first Monday of lessons. If it is after that Saturday, you may contact the pool manager directly and see if they can fit you into the schedule, but for the most part, the schedule will be set at that time. If you do sign up for your lessons over the phone, you must come and sign your registration form at the front desk either before your first lesson or on the first day of your lessons. If you register for a group class and a minimum of 2 swimmers do not sign up for the class, the class will be canceled. In this event, the pool manager will contact you directly and help you get into another class that met the required number of students or combine classes that did not meet the requirement so that at least one class can take place (example – a 3:00pm turtle I class only had one student and a 3:30pm turtle I class only had one student, those classes would be combined at a time that both students could make it in order to meet the required number of swimmers). Remember, your child’s first swim lesson (or even their fifth!) is very exciting and rewarding. Get excited with your swimmer and make sure they are having the best time they can. Remind your swimmer of how proud of them you are (even for the smallest of achievements) and talk with your instructor every day about their progress. The instructor will always come over to talk with you, but please make sure you have time in your schedule to stay a few minutes after class to talk with them. The best way to make sure your child, not only retains what they learn, but continues to learn is to practice with them. Even if it is just once a week once their lessons are over or on the weekends between lessons, it will really help the swimmer retain the skills they have learned and continue to build more! TIP: Feel free to ask the instructor for ideas on how to practice your swimmers new skills with them. If you have any questions, concerns, or feedback about our swim program or your swim lessons, please contact the pool manager at that specific gym. If the manager is not available at the moment you call, please leave them a voicemail and they will return your call as soon as they can. We very much appreciate feedback, good or bad, in order to help our program improve. At the end of every session of lessons, we pass out evaluations for our instructors and we ask that you please fill them out completely and honestly. We appreciate hearing how your lessons went and our instructors love knowing how they did. We take them very seriously and we value your opinion.